War is hell, but wartime also breeds radical innovation. One interesting example is the lowly wristwatch, first adopted by military officers in the 1880s to replace awkward pocket watches. Michael Friedberg explains further at timezone.com: "Girard-Perregaux by 1880 supplied wristwatches to the German Imperial Navy. Reportedly, an artillery officer complained that it was inconvenient for him to be operating a pocket watch –an act requiring two hands— while timing a bombardment. He strapped a pocket watch to his wrist and reported his solution to his superiors. They liked the idea so much that watchmakers in La Chaux-de-Fonds were asked to travel to Berlin to discuss series production of small gold watches attached to wrist bracelets." These early watches, dubbed 'wristlets,' were often based upon compact ladies pocket watch mechanisms. At the outbreak of World War I these timepieces were seen as too fragile and feminine for combat, but soldiers adopted wristlets because of their convenience. 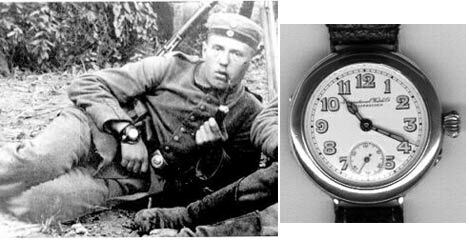 In fact, it was common for infantrymen to purchase their own watches during the Great War. Watches soon appeared with metal lids, mesh guards known as trench grills and various other add-ons intended to make them more robust. The war saw millions of young men adopt the wristlet, which soon became a must-have accessory for men and women alike. Though its popularity grew by leaps and bounds, the name gradually fell out of favor and nearly every manufacturer referred to their timepieces as wristwatches by the mid-1920s.